In an effort to have the homecoming game earlier in the season, the C-EB Homecoming game will be Sept. 8 against Todd County. 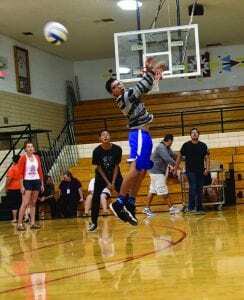 The challenge with an Sept. 8 game is that it falls the week of Labor Day, and the Friday after the Cheyenne River Sioux Tribe Labor Day Fair and Rodeo events. Students started school on Monday, August 27, attended school for four days, and then had Friday, Monday and Tuesday off. To ensure students were able to have a full week of traditional homecing activities, the High School decided to begin the celebration on Wed., August 29 with a dress challenge and class competitions. 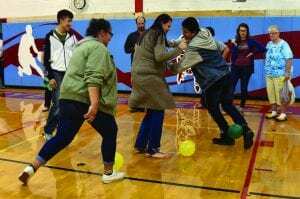 Students participated in color day and beach party day, and competed in various class competitions in the high school gym, such as wheel barrel races, balloon stomp, and a volleyball tournament. Students return to school on Wed., Sept. 5, and will participate in a singing B among other cass competitions. The homecoming king and queen will be announced on Wed. evening at 6:00 p.m.
Friday at 1:00 p.m., students will host and view the annual homecoming parade, and meet up after in the gym for the pep rally. Game time is 6:00 p.m. on the C-EB football field. Come support the C-EB Braves against Todd County, and recognize the homecoming royalty.